Thousands of vulnerable young people could be made homeless as a result of the government’s plans to scrap housing benefit payments for jobless 18-21-year-olds, the YMCA has said. The youth charity which itself houses around 1,400 youngsters in supported accommodation who would be affected by the change, says the policy will save little money for the taxpayer but cause instability for youngsters who have fled family breakdown and abuse. “The government could be in danger of inadvertently taking away support from the young people who need it most, and in doing so, exposing many more vulnerable young people to the risk of becoming homeless,” it said. The government argues that its plans to end entitlement to housing benefit for unemployed youngsters will remove the incentive for them to leave home and live on benefits. The policy, which would affect all new claimants after April 2017, will save £135m over four years, according to government projections set out in the budget. But the YMCA says once exempt groups are taken into account such as care-leavers, together with knock-on costs to public services of dealing with increased homelessness among who lose support, the net savings are likely to be just £3m. 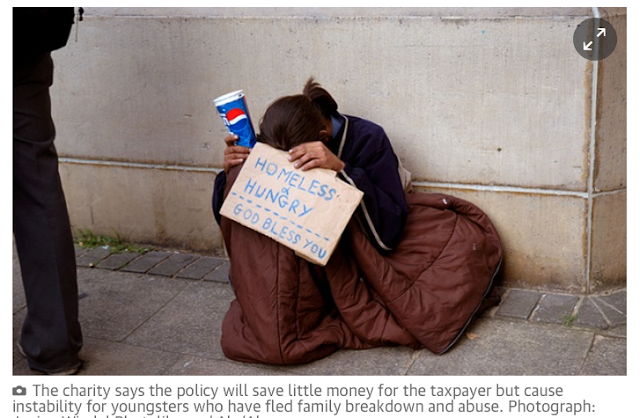 Denise Hatton, the chief executive of YMCA England, said: “In seeking to tackle those small numbers taking advantage of the system, the government is in real danger of inadvertently taking away support from some of the country’s most vulnerable young people. “In removing automatic entitlement to housing benefit, young people could face the prospect of losing not only a safety net but also a springboard that helps get them up and get their lives back on track. A spokesman for the Department for Work and Pensions said: “This report is deliberately misleading since we have been very clear that vulnerable young people including care-leavers and people with children will be exempt from this policy. The government is likely to exempt care-leavers, those with dependent children, disabled youngsters who are unable to work, and young people who have been working for six months before claiming. YMCA says that before exemptions 19,000 young people currently claim job seeker’s allowance (JSA) and housing benefit, equivalent to less than 1% of all housing benefit claimants. It rejects the idea that this group is pursuing a “lifestyle choice”, pointing out that nearly three-quarters of this cohort claim for less than six months, suggesting it is a short-term safety net. JSA is £57.90 a week, while average housing benefit payments are less than £75. The charity points out out that the numbers of 18-21-year-olds claiming both entitlements has halved in the last two years and is falling faster than any other age group. Over two-thirds of 18-21-year-olds live at home with parents, a proportion that has risen over the past decade.